The manufacturing of Sing Square Logs starts with quality Douglas fir, western red cedar, or pine taken either from small logs or pre-milled lumber. The lumber is then dried in Sing Home’s kilns until the moisture content is stabilized at around 12%. Our patented sawing technique is used to produce quarter-sawn, all vertical or straight grain wood strips from the lumber, with their internal stress relieved. The strips are then laminated with non-toxic glue to form one side of the Sing Square Log. Two laminated “‘walls”, with their wanes and imperfections turned inside, are then joined together with wood spacers and metal fasteners to form a single log assembly. The quarter-sawn, vertical grain laminates give the Sing Square Log its remarkable dimensional stability— with virtually no shrinking, checking or splitting. Most lumber available is plain sawn (also called flat sawn), which produces the maximum yield and therefore the greatest economy. Plain-sawn lumber has varying grain orientations— the annual growth rings can run parallel, diagonal or perpendicular to the face of the board. This variation causes un-even drying and the board has a greater tendency to warp (cup, twist, and bow). The board will also shrink considerably in thickness as well as width. Quarter sawing produces lumber with annual growth rings running almost perpendicular to the face of the board. Boards with consistent vertical grain orientation tend to remain flat despite changes in moisture content. This dimensional stability gives quarter-sawn lumber its most desirable quality. Quarter-sawn lumber also has superior ability to hold paints and stains. Vertical grain lumber commands a high premium because quarter sawing requires more time and skill but yields less board footage. The Sing Square Log’s thick double wall provides the thermal mass to absorb, store and slowly release heat over time. This means that it takes a long time for temperature outside a Sing Log Home to change the temperature inside. Building with Sing Square Log is simple and straightforward. The first layer of logs is anchored to the foundation with the supplied 1/2″ thick steel plates. Subsequent layers are stacked up by applying construction adhesive to the double T&G logs, then fastening them with the supplied Olylog© screws. Two laminated ‘walls’, with their wanes and imperfections turned inside, are then joined together with wood spacers and metal fasteners to form a single log assembly. 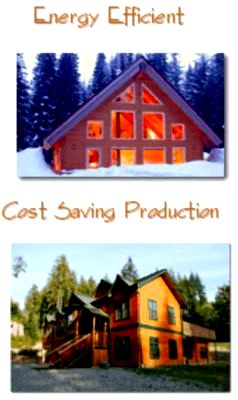 On left is a 2×6 frame home, the middle picture is a SIP home (Structural Insulated Panel home), on the right is a Sing Insulated Log home wall. Trust your eyes and brain as to which is stronger, more energy efficient, longer lasting and simpler to build. The Sing modular log on the right does not require framing, insulation, sheetrock, vapor barrier, or siding as an insulated panel home, post and beam and 2×6 frame home does. Sing logs are made of super strong, highly insulated Sing Honeycomb core. It is far stronger than the insulated panel home and is earth friendly being constructed with clean wood veneer. Urethane foam used in the Sing Honeycomb panel log is almost double the EPS used by the panel home (insulated structural panel home). 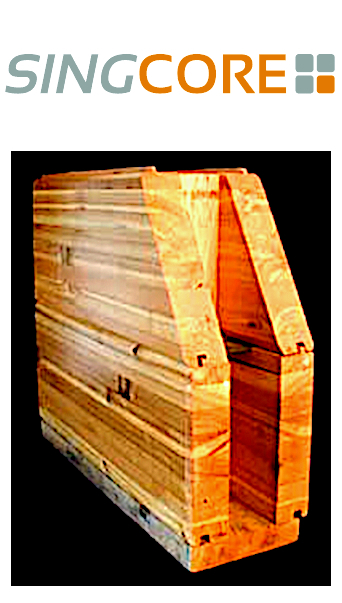 The standard size exterior Sing Square Logs are 8″ wide by 10″ tall and up to 8′ long. Our advanced quarter sawing technique enables us to offer such considerable amount of solid timber with virtually no twisting, cracking and shrinking. As with other vertical and straight grain products in the Sing Log family, they are among the most dimensionally stable engineered solid wood products on the market today. Sing Homes are many times stronger than conventional frame homes. Please visit the Engineering page for the shear wall test report from University of Washington. The Sing Square Log’s thick double wall provides the thermal mass to absorb, store, and slowly release heat over time. This means that it takes a long time for temperature outside a Sing Log Home to change the temperature inside. Temperature swings and sudden loss of warm or cool air are minimized. The result is a comfortable indoor environment all year round. The thermal mass effect also benefits the house’s energy efficiency, as the heating and cooling equipment does not have to run as often. The standard exterior Sing Log wall, with its patented air cavity alone, already exceeds most energy code requirements. You can further boost the system’s energy efficiency by filling the log wall cavities with expandable urethane foam, which typically offers an R-value of 6 per inch. The combined R-value of such insulated Sing Log wall is approximately 37 to 42. The urethane foam also offers the additional benefit of sealing the house tight to prevent air leak and heat loss. The average cost for adding urethane insulation to a Sing Log wall package is only $2000.00 . Major savings can be achieved through lower utility bills as well as downsizing heating /cooling equipment. 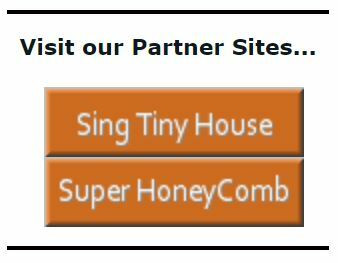 All Sing Home building products are manufactured with untreated, natural wood, wood fibers and non-toxic glue. They replace many conventional building materials that often contain toxic chemicals or off gas obnoxious fumes. As more and more people are suffering from asthma, allergies and indoor air quality related health issues, Sing Log Homes have clearly become a preferred choice. 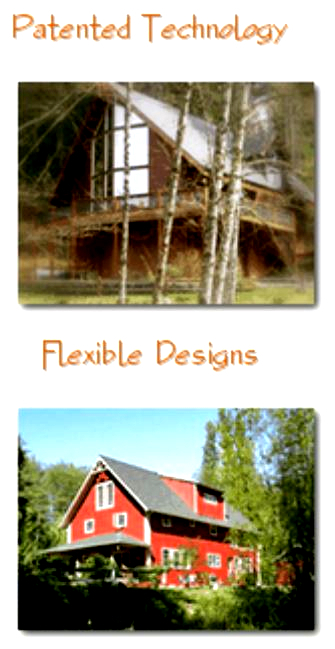 Conventional log homes are often regarded as natural and healthy homes. Yet the log’s inherent settlement and shrinkage often create crevices where moisture can seep through, resulting in mold, fungus and pest problems. Sing Log’s dimensionally stable, smooth planed surface will minimize such negative impacts. Our patented quarter sawing technique allows us to make use of lumbers rejected by regular lumber mills. These otherwise fine lumbers are often considered unusable or “defective” by other mills because they are too small in diameter and /or containing wanes. Instead of heading to the chippers, they were salvaged and turned into the remarkable building blocks for your fine home. All Sing Home building products maximize the strength and function of natural wood fiber with less consumption of energy during the manufacturing process. Sing Home building products are also, longer lasting than other materials commonly used in housing projects. That means less waste sent to the local landfill. It is very difficult for average log homes to exceed 8 feet in height due to the settling problem. Sing Homes often reach beyond 30 feet high. Think of Sing Logs as Lego blocks, your imagination is the limit! Sing Homes have the most variety of styles. Check out our Photo Gallery. Sing Home has eliminated many conventional building processes and materials; such as exterior, siding, vapor barrier, sheathing, framing lumber, batt insulation and drywall–less labor and less material. Sing Homes on the average are assessed at more than 15% of the average frame home of equivalent size. Compared to traditional and milled log homes, Sing Homes are easier to build because Sing Logs are square, double tongued-and-grooved and not as heavy. Compared to framed houses, the built-up wall assembly has been reduced to pre-assembled blocks with interior and exterior wall ready at the same time. Many Sing Home owners built their dream homes with little professional help. The Sing home-building system started in 1992 as the founder /inventor Peter Sing patented his first vertical grain square log. There were already 24 patents under his name at that time. Since then, there have been a dozen more inventions related to home building products and methods and most are now in production as part of the Sing home-building system. All the inventions of Mr. Sing are based on improving our life style with the least burden to our Mother Nature. These inventions pertain to energy efficient, sustainable, environmentally friendly, non-toxic, recyclable, longevity building materials. These are the prime emphasis of the Sing home-building system. Because of this, Sing home has been invited to build several full size homes in different home shows. Over the last 20 years Sing Home has proven itself to be among the strongest, most energy efficient and environmentally responsible of home-building systems. In 2002 Sing home was honored to build the featured home in the San Francisco bay area, at the Peninsula Home Show. Sing home building materialsfeature dimensionally stable vertical grain timber, which is –less twisting, checking and shrinking. It provides the greatest strength and utilizes the less natural wood fibers. Author singloghomesPosted on September 22, 2016 Categories Uncategorized1 Comment on Hello world!